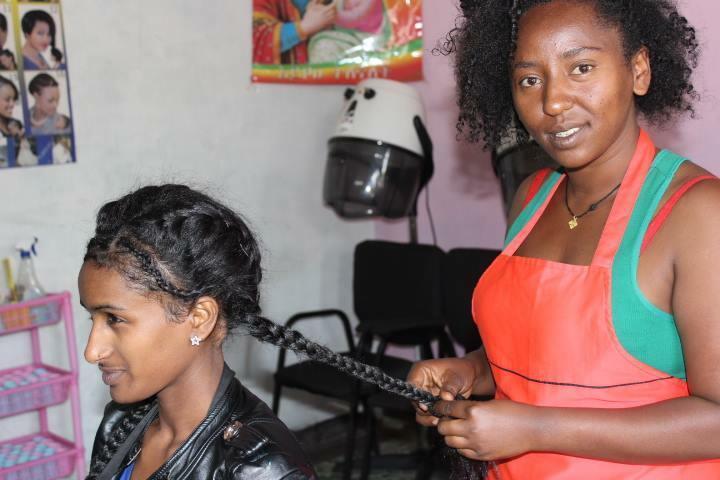 Having trained as a hairdresser and learned how to be an entrepreneur, Mahlet has opened her own hairdressing salon in a suburb of Addis Abeba. The days when someone else could be Mahlet’s boss are over – she is now in charge of her own life. Mahlet is a typical example of the young women who have been given training at the Good Samaritan Training Centre (GSTC) in one of the Ethiopian capital’s suburbs. At the centre, young women in difficult situations are offered vocational training. Most of them are young, single mothers with no or only very basic schooling. Many of them are the victims of serious violence. Although only 25 years old, Mahlet had a long and difficult life before she set up her own salon. A daughter in a poor family, she had to leave school early and was sent to Dubai to work as a maid and send money home. There, she became a victim of sexual abuse and became pregnant, and was sent back to Ethiopia. Mahlet’s family thought she had brought shame upon the family and they married her off to a man who promised to look after her and her family. Once married, she became pregnant again, only to be left by her husband, now she had two small children. She says that she felt helpless. There was no hope, her family did not want to have anything to do with her, and she was quite alone in the world. For Mahlet, everything changed in 2014, when she was accepted for hairdressing training at the GSTC. The young woman was eager to grasp this new opportunity and having finished her training she started her own hairdressing salon. Business is brisk, she has hired an assistant, and has plans to expand the business. The 25-year-old woman is proud and pleased with her achievements. With an income of about USD 200 per month (approx. NOK 1650) she can provide for her two children, who are now six and four.